Sculpting the body is a process that is advancing in technological possibilities thanks to products such as the I-Lipo. This laser-based hardware comes from the advanced solutions being formulated by Chromogenex. A recent winner of Venture Capital Team of the year, this organization leads the United Kingdom in innovation of laser technologies and intense pulsed light (IPL) systems. Since 1985, advances relevant to aesthetic concerns such as hair removal, vascular lesions, acne, and skin revitalization have benefited from the breakthroughs that they have made. They were the first company to receive FDA clearance on a number of ground-breaking treatments that have included those relevant to wrinkle reduction and inflammatory acne vulgaris. The body naturally goes through a metabolic process for releasing excess energy that is stored in tissue throughout the body. This process that is triggered hormonally in the brain can also be induced using this low-level laser. Delivers immediate results when sculpting the body through providing a process that is safe, effective, and clinically proven. Releases energy that plays a vital role in shrinking fat cells that cause the problem areas that patients wish to correct. Triggers fat cells that hold a large portion of energy to be broken down from triglycerides into acids, glycerol, and water that the body can use when reserves are low. This devices utilizes low-level laser technology in order to encourage the body’s natural processes for releasing stored energy from adipose tissue. Passive treatments, meaning the device does not to be manipulated once placed over the area of concern. Versatility; allowing the treatments can be used multiple times on all types of skin, requiring only two treatments per week over a four-week period to be effective. This non-invasive procedure takes under 20 minutes and there is no time needed for patient recovery. After a round of treatments, patients report fat loses as high as 10 percent. 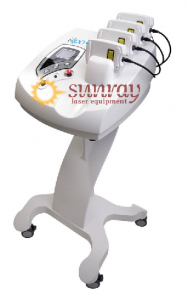 Refurbished I-Lipo units are available through SunrayLaser.Com. Our vast experience with this type of technology allows us to help you expand the potential treatments in your office. If you have questions about pricing and other features of this equipment please fill out the contact form below to reach us, we’d gladly engage with you shortly.